Browser used and possibly Operating System of your Computing Device and the Name of your Internet Access Provider. The legal Basis for the Data Processing is Art. 6 Abs. 1 S. 1 lit. f DSGVO. Our eligible Interest is based on the previously listed Manners for Data Collection. In no Case we use the collected Data in order to identify the Website Visitor. In addition we apply our Website Cookies and Analysis Services. Further Details can be found in Point 4 and 5 of this Data Protection Regulation. Forwarding your personal Data to Third Parties does not take place except for the following Reasons. it is legal and according to Art. 6 Abs. 1 S. 1 lit. b DSGVO necessary for the processing of contractual Relationships with you. In addition we use temporary Cookies to optimize Usability which are saved for a particularly scheduled period of time on your Device. If you visit our Website again to absorb our Services it can automatically recognize that you have previously visited us and which Input and Settings you have made, so that you don’t have to enter this again. The processed Data by Cookies is necessary according to Art. 6 Abs. 1 S. 1 lit. f DSGVO in order to preserve our legitimate Interests and those of third parties. Most Browsers accept Cookies automatically. It is possible to configure your Browser to decline Cookies or to notify you before a Cookie is being created. If you completely deactivate Cookies it is possible that you can not use the full Functionality of our Website. The following specified and from us used Tracking-Methods are being used based on Art. 6 Abs. 1 S. 1 lit. f DSGVO. With the used Tracking-Methods we want to assure a customized Presentation and continuous Optimization of our Website. Further we use Tracking-Methods to retrieve the Usage of our Website statistically and to analyze our Services to optimize them for you. These Interests are legitimated by the aforementioned Prescription. The particular Data Processing Purposes and Data Categories are described in the respective Tracking-Tools. are being transferred to a Server of Google in the USA where they are saved. The Information is used to evaluate the Usage of the Website, to create Reports about the Website Activities and to provide further Services referring to the Website Usage and Internet Usage for market research and customized Presentation and continuous Optimization of these Websites. If needed these Informations are transferred to third parties in case of legal prescription or if third parties process the Data by Order. In no Case your IP-Address is brought together with other Data from Google. The IP-Addresses are anonymized so that an assignment is not possible (IP-Masking). You can disable the Installation of the Cookies by adjusting the Settings of your Browser-Software. This may cause that not all Functions of the complete Website will be available. On top of that you can prevent the collection of Data and your Data related by Usage of the Website (incl. your IP-Address) saved in the Cookie by downloading and installing a Browser Add-On (https://tools.google.com/dlpage/gaoptout?hl=de). Alternatively to the Browser-Add-On, especially for Browsers on mobile Devices, you can prevent the logging by Google Analytics by clicking the following Link: https://tools.google.com/dlpage/gaoptout?hl=de. A Opt-Out-Cookie will be set to disable future logging of your data when visiting this Website. The Opt-Out-Cookie only works in this Browser and only for our Website and is saved on your Device. If you delete your Cookies in your Browser you will have to set the Opt-Out-Cookie again. Further Information about Privacy Protection related to Google Analytics is available in the Google Analytics-Help Site (https://support.google.com/analytics/answer/6004245?hl=de). According to Art. 6 Abs. 1 S. 1 lit. f DSGVO we use Social Plug-ins on our Website provided by social Networks like Facebook, Instagram and LinkedIn to increase the publicity of our Law Firm. The commercial Interest is a legitimate Interest in the legal sense of the DSGVO. The Responsibility for privacy protection compliant Operation must be provided by the respective Supplier. We integrate the Plug-ins by using the socalled Two-Click-Method to protect Users of our Website best possible. Our Website uses Social-Media Plugins by Facebook to make their Usage more personal. Herefor we use the „LIKE“ or „SHARE“-Button. This is a Service provided by Facebook. If you view a Page of our Website including such a Plugin your Browser directly connects to the Servers of Facebook. The Content of the Plugin is being transmitted to your Browser directly from Facebook which embedds it in the Website. By Embedding the Plugin Facebook receives the Information that your Browser has viewed the specific Page of our Website, even if you don’t have a Facebook Account or are not logged in at Facebook. This Information (including your IP-Address) is sent from your Browser directly to a Server of Facebook in the USA where it is saved. If you are logged in on Facebook it can directly assign your Visit on our Website with your Facebook-Account. If you interact with the Plugins and click the „LIKE“ or „SHARE“-Button for example the according Information will directly be transferred to a Server of Facebook where it is saved. The Information is published at Facebook and shown to your Facebook-Friends. Facebook may use this Information for the purpose of Advertising, Market Research and the customized Presentation of the Facebook-Pages. Facebook creates Usage-, Interest- and Correlation-Profiles to analyze your Usage of our Website regarding the displayed advertisement to you by Facebook, to inform other Facebook-Users about your Activities on our Website or to provide further Services connected to the usage of Facebook. If you do not want Facebook to assign the collected Data on our Website to your Facebook-Account you must log out from Facebook before visiting our Website. Purpose and Extent of Data Collection and further Processing and Usage of the Data by Facebook as well as your referring Rights and possible Settings of your Privacy Protection can be found in the Privacy Policies (https://www.facebook.com/about/privacy/) of Facebook. Our Website uses socalled Social Plugins („Plugins“) of Instagram which is being operated by Instagram LLC., 1601 Willow Road, Menlo Park, CA 94025, USA („Instagram“). The Plugins marked by a Instagram-Logo for example in form of a „Instagram-Camera“. When you visit a Page of our Website containing such a Plugin your Browser directly connects to the Servers of Instagram. The Content of the Plugins is directly transferred to your Browser by Instagram and embedded in the Page. With this Embedding Instagram recieves the Information that your Browser visited the particular Page of our Website even if you don’t have an Instagram-Account or are presently not logged in on Instagram. This Information (including your IP-Address) is directly transferred from your Browser to a Server of Instagram in the USA where it is saved. If you are logged in on Instagram they can immediately assign your Visit on our Website to your Instagram-Account. When you interact with the Plugins by clicking the „Instagram“-Button for example this Information will be aswell transferred to a Server from Instagram where it is saved. This Information will be published on your Instagram-Account and shown to your Contacts. If you do not what Instagram to directly assign the Data collected on our Website to your Instagram-Account you mus log out from Instagram before visiting our Website. Further Information can be found in the Privacy Policies (https://help.instagram.com/155833707900388) of Instagram. Our Website contains Plugins of the social Network LinkedIn operated by LinkedIn Corporation, 2029 Stierlin Court, Mountain View, CA 94043, USA („LinkedIn“). You can identify LinkedIn-Plugins by seeing the LinkedIn-Logo or the “Recommend-Button” on our Website. When you visit or Website the Plugin builds up a direct connection between your Browser and the LinkedIn-Server. LinkedIn thereby recieves the Information that you visited our Website with your IP-Address. If you click on the LinkedIn-Button while you are logged in on your LinkedIn-Account you can set a Link to the Content of our Website in your LinkedIn-Profile. Thereby LinkedIn can assign your Visit on our Website to your User Profile. We point out that we recieve no Knowledge of Content of the transferred Data or their Usage by LinkedIn. In Order to prevent LinkedIn from collecting the previously named Data on our Website please logout from LinkedIn before visiting our Website. Purpose and Extent of the Data Collection as well as the further Prosessing and Usage of the Data by LinkedIn and your concerning Rights and Adjustment Possibilities to ensure your Privacy Protection can be seen in the Privacy Policies of LinkedIn (http://www.linkedin.com/static?key=privacy_policy&trk=hb_ft_priv). to demand the Deleting of your individual-related Data saved by us according to Art. 17 DSGVO unless the Processing is necessary to practice the Right of Freedom of Expression and Information, the Fulfillment of a legal Commitment, the Cause of public Interest or for the Enforcement, Practice or Defence of a legal Claim. to complain to a Controlling Institution according to Art. 77 DSGVO. Usually you can contact the Controlling Institution of your usual Haunt or Place of Work therefor. In case your individual-related Data is processed on Basis of legitimate Interest according to Art. 6 Abs. 1 S. 1 lit. f DSGVO you have the Right to object to the Processing of your individual-related Data if there are Reasons based on your special Situation or if the Objection is to direct Mail according to Art. 21 DSGVO. In the last Case you have a general Right to object which is converted by us without Declaration of a special Situation. 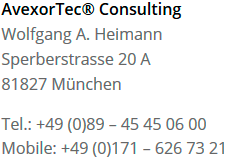 In Case you would like to make Use of your Right to Repeal or Object an Email to info@avexortec.de is sufficient. For your Website-Visit we use the common SSL-Procedure (Secure Socket Layer) each combined with the highest Encription Rate supported by your Browser. Usually this is a 256-Bit Encription. If your Browser does not support 256-Bit Encription we use 128-Bit v3 Technology insetad. If a single Page of our Internet Presence is transferred encriptedly your Browser will display a closed Icon of a Key or a Lock in your Address- or lower Status-Bar. We incidentally operate with technical and organizational Safety Functions to protect your Data against accidental or deliberate Manipulation, partial or complete Loss, Destruction or against unauthorized Access by third Parties. Our Security Functions are currently being improved according to continuous technical Development. This Data Privacy Statement is currently valid as at May 2018. Further Development of our Website and Services as well as Supplies on top or because of changed legal respectively official directive can make it necessary to change this Data Privacy Statement. 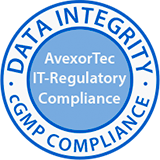 The commonly current Data Privacy Statement can be viewed und printed by you at any time on our Website under https://www.avexortec.de/privacy-policy/.